The thick tissue on the bottom of your foot that connects the heel bone to your toes and creates the arch in your foot is the plantar fascia. When this band of tissue becomes overstretched or over used, it becomes swollen or inflamed. This swelling or inflammation is called plantar fasciitis. It can make walking or any other use of your foot difficult. While both men and women get plantar fasciitis, it is more common in active men 40 and older. 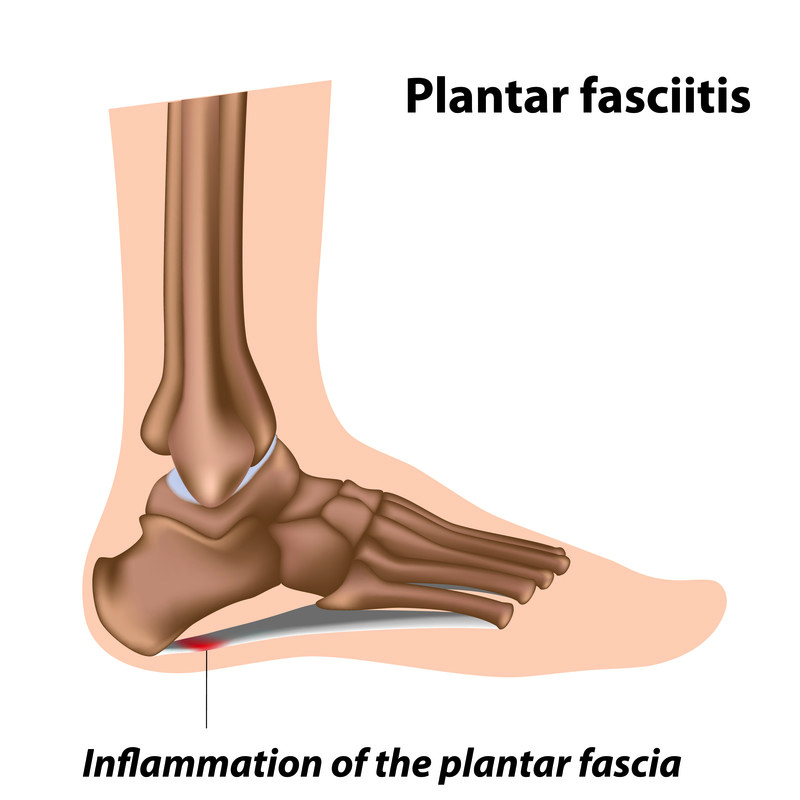 Plantar fasciitis is felt as pain and stiffness in the bottom of the heel. Some patients will experience pain in the mid foot area of the bottom of their foot. You may experience the pain as dull or sharp that may ache or burn. The pain may slowly develop over time or have a sudden onset after intense activity. Usually the pain is worse in the morning when you take your first steps or after you have been inactive for a while. Intense activity may also increase the pain. Usually you can obtain pain relief from nonsurgical treatments. The relief will not happen overnight. It normally takes at least a couple of months up to two years to find relief from pain. Some patients do need surgical intervention. The provider may take x-rays or MRIs to rule out other diagnoses. If you ignore the condition you may develop chronic heel pain, which will probably alter the way you walk. When you change your gait, you are at risk of developing hip, leg, knee, or back pain. In a recent study PRP was found to be a more effective treatment than steroid injections for chronic cases of plantar fasciitis. It increased long term function and relieved pain. Nonsteroidal anti-inflammatories, such as acetaminophen or ibuprofen to reduce pain and inflammation. Surgical relief is recommended only for those who cannot find relief in any other way. The surgeon may recommend one of two surgeries. One surgery involves partially detaching the plantar fascia from the heel bone. This procedure will often weaken the arch of the foot and you may lose full function of your foot.